Computer science was not offered at her high school, so as a freshman at MIT, she enrolled in her first programming class and it “completely clicked” for her. After graduating Amert, spent three years in industry working at Microsoft. But she began to feel like the projects she was really excited about were coming out of Microsoft Research. So, she got in touch with a contact there who told her if she really wanted to be working on the cutting edge of research, a Ph.D. was needed. Amert then felt like a Ph.D. would open more doors than they would close, and began applying to Ph.D. programs. Amert’s specialty is in computer graphics, specifically physically-based simulations. She first took an interest in cloth simulation after watching extra features on a Shrek DVD. 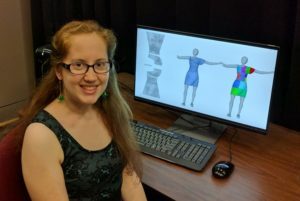 “I was so fascinated that they had these tools to model characters and improve the visualization.” It inspired her to take a computer graphics class in her junior year of college, and this is the focus of her Ph.D. research. 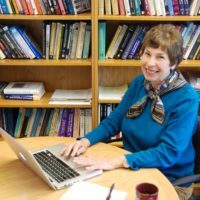 In undergrad, Amert did not participate in many women in computer science activities because of her heavy course load. But after experiencing some isolation in the working world, she returned to school with a personal commitment to become more active in the community. At Microsoft, Amert would often be one of only two female engineers in a room of 15-20 people, and began to feel the disparity. So when she was invited to speak at CRA-W’s Virtual Undergraduate Town Hall (VUTH) this summer, Amert gladly accepted and shared her experiences with the participants. VUTH events are webinar sessions designed to give students the opportunity to learn more about a specific discipline in computer science and also ask the host and speaker mentoring questions to help them prepare for graduate school. Presenting at the webinar also helped her practice how to explain her research in a high level way to broader audience. She presented the same set of slides to her mother, who doesn’t have a technical background, to help her mother understand specifically what her research is about. Despite successes, Amert also battles with feelings of imposter syndrome. To combat this, one thing she finds useful, especially when she starts to feel discouraged or like she doesn’t belong, is to focus on her positive outcomes. Amert was previously a tutor and kept her course evaluations, so she often looks back at her positive reviews when she gets discouraged. Interview with Lori A. Clarke Fresh off the Press…Winter/Spring 2017 Newsletter!